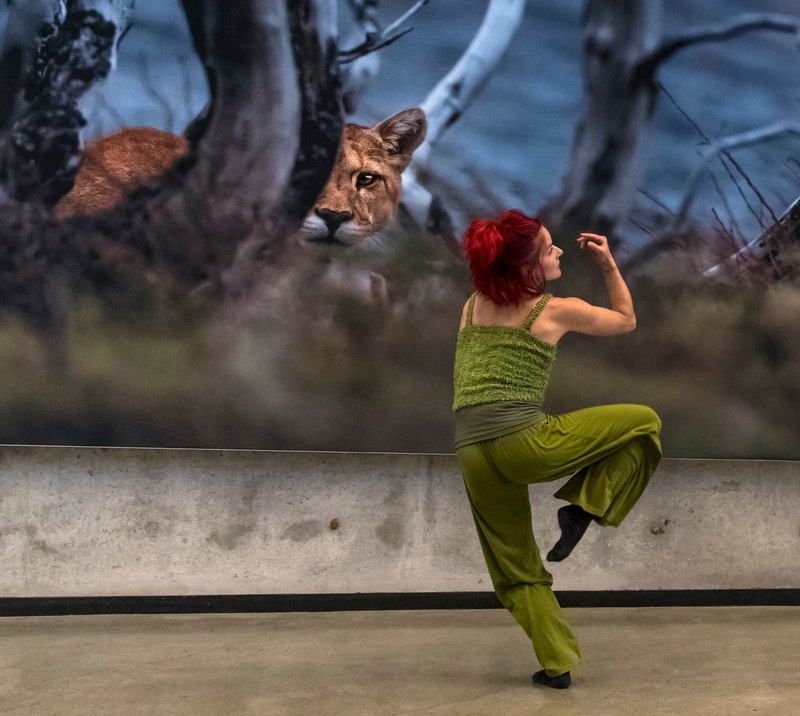 ODC - "Path of Miracles"
Intentionality was certainly evident in the new work, held this past weekend at the David Brower Center in Berkeley. The current exhibit in the Center’s lobby, titled “Douglas R. Tompkins – On Beauty”, pays tribute to conservationist Douglas R. Tompkins with a collection of vast photographs by Antonio Vizcaíno. Stunning images of national parks in Argentina and Chile graced the walls, lands that Tompkins had long been dedicated to preserving and protecting. It was amongst these pictures and the Center’s own structural elements that Karp’s On Beauty would unfold, a thirty-minute quintet performed by the incomparable cast of Sonsherée Giles, Sebastian Grubb, Amy Lewis, Megan Lowe and Charles Slender-White, set to a score by longtime collaborator Charles Amirkhanian. On Beauty began above us, in the Center’s square atrium. We looked up and saw the ensemble taking turns sliding, turning, rebounding and suspending off the railing. Bodies and arms rippled delicately, carving out the space. Waves of sound permeated the room; low enough in tone that it made you wonder whether this was indeed water or the subtle roar of an animal. These opening moments revealed one of the strongest intentional themes running through the work. That of scarcity. Only parts of the dance were visible, and everyone in the audience had their own unique lens, depending on where they were standing in the space. Considering the Center’s celebration of conservation and this particular conservationist, On Beauty’s comment on scarcity (which would continue throughout the work) was particularly poignant. 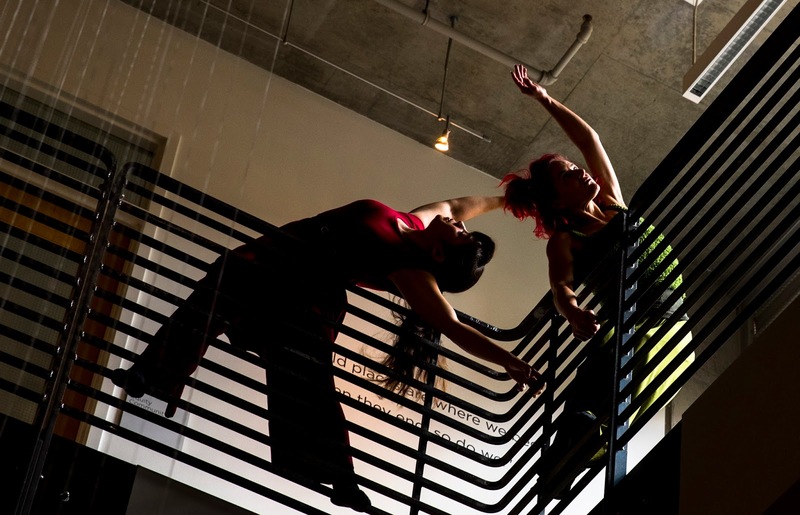 Then the dancers moved to a corridor on the Center’s main level. With a spectacular, vibrant photo in the distance, they, costumed by Giles in the same bold colors as the photograph (again another intentional connection), began to explore the air around them. Hands carefully and mindfully washed and swept the space; the spine, core and legs eventually joined in the movement; and the phrase accumulated and changed levels. But everything grew from those first hand motions, cleaning and protecting the landscape. We walked down that same corridor into another slightly larger room, the concrete pillars and floor suddenly making a more visible impression. In this next group sequence, the sweeping arms and legs recurred from the previous vignette, while new material was also added in. Standing on one spot, the dancers swayed gently, as blades of glass in the wind. Pathways were investigated through the circuit of the limbs, chaîné turns in plié, and leg extensions enveloped into passé. The dancers clustered against the stone pillars of the building, altering the visual perspective and transforming the pillars’ surfaces. Though standing vertical, the movement encouraged you to consider them as the base, the floor. All of the choreography was so calm and legato, whether a simple hand gesture or a dynamic lift, and much of it (the swaying like blades of grass) evoked the natural processes, elements and wonders depicted in the nearby images. On Beauty led us into another small corridor, keeping its eye on the building’s structural details. Here as well, the walls were not simply framing the action; they were active players in the scene – as supports, as counterbalances – Karp engaging the surrounding environment in the overall experience. Again, the thread of scarcity ran through. There was dance happening on a nearby staircase, but depending on where you were, you might not have seen it (I didn’t). Once you arrived at each performance ‘station’, moving around wasn’t really an option. At least not on Saturday night with the size of the audience coupled with the small space. But again, perhaps that was purposeful! The cast re-assembled for On Beauty’s final chapter, a section about looking outward and being in community. Arms peeled up from body, eyes looked beyond the fingers. Shinbusters (whose piercing beams had unfortunately been tough to avoid throughout the performance) projected shadows on the walls, making it feel like many more souls were present. There was an awareness of sharing the space, certainly with other individuals, but also perhaps with other beings and other lifeforms. A desire to be cognizant of co-existence. 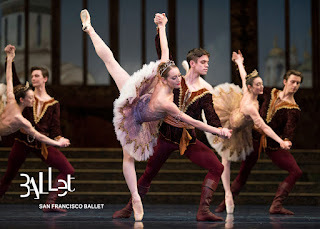 San Francisco Ballet - "The Sleeping Beauty"
It was all because of a missed invitation. The entire story of The Sleeping Beauty comes down to that single incident. The Fairy of Darkness wasn’t on the guest list for Princess Aurora’s christening, and boy, was she mad. She curses the baby and sets in motion the events of the full-length story ballet. This past weekend saw the final performances of San Francisco Ballet’s The Sleeping Beauty, the first program of their 85th repertory season. Choreographed by Artistic Director Helgi Tomasson (after Marius Petipa), this jeweled, gilded version, set in 17th and 18th century Russia, debuted back in 1990. But this was the first time I had seen the production. The curtain rose to reveal a golden proscenium arch and a scrim with cobalt blue curtains painted on it. While fairly simple (at least compared to the rest of the sets, costumes and design), this was one of my favorite theatrical devices. Right before the Prologue and all three Acts began, this blue curtain would become transparent, revealing a frozen scene. Then the scrim would rise and the action would commence. The intermediate curtain transformed the stage into a storybook, a dynamic one that the audience would witness coming to life. As the Prologue got underway, a mix of mortal and celestial beings started arriving for Aurora’s christening, including the Lilac Fairy (Jennifer Stahl) and her entourage. The fairies danced a number of group sequences brimming with petit allegro (nice addition of Russian pas de chats considering the setting) and batterie. Bourées figured heavily into their choreography, which gave a terrific fluttering sensation to their presence, though they occasionally struggled with unison. All the fairies danced their solos with confidence and artistry, even managing to traverse some finicky directional changes in the choreography. Standout moments included Norika Matsuyama’s spritely enchaînement as the Fairy of Playfulness and Ellen Rose Hummel as the Fairy of Courage. With its strong lines, speed, precision and musicality, Hummel’s solo looked almost neo-classical. As the Fairy of Darkness (Wanting Zhao) arrived, the occasion took a sharp and dark turn. Enraged at being excluded, she curses the baby princess. The Lilac Fairy intervenes, not erasing, but successfully mitigating the Fairy of Darkness’ actions. Act I propels sixteen years ahead to another celebration – Aurora’s birthday. At this point, the ballet has already been going for at least forty minutes, but this is Aurora’s first true appearance. As the princess, Frances Chung burst into the space with excitement and joy. And on Saturday afternoon, this Act was hers. In the lengthy, and famously difficult rose adagio, Chung shone - the long sustained balances on pointe, legato transitions, swirling rond versés and the unpartnered arabesque sequence. And of course, the final series of promenades in attitude (with the four suitors); every moment was sublime. Chung’s second variation with the four men was beautifully danced, but after the rose adagio, felt unnecessary. And as the curtain falls on Act I, the prophecy is fulfilled. Aurora pricks her finger on the spindle, and she (along with the entire realm) falls into a deep slumber. The next two Acts both contained fine dancing, though structurally and narratively, they could afford to be edited. Most current or recent versions of The Sleeping Beauty (Tomasson’s included) are already cut down significantly from earlier iterations. But that doesn’t mean additional downsizing can’t occur. Act II’s first scene, ‘The Hunt”, is really just a chance to introduce the character of Prince Desiré (Vitor Luiz), which can happen fairly quickly. Then, the Lilac Fairy enters the picture for the second scene, called ‘The Vision’. While this is an important link between the Prince and the overall story, again, it could be shortened. The Prince, Lilac Fairy and Aurora danced a lovely, subtle pas de trois, and the women’s corps, as the nymphs, offered interesting stage patterning and some of the best unison of the afternoon. Their faces, however, were a mystery. I appreciated that the corps didn’t have broad stage smiles, which wouldn’t have fit at all with the scene. But what sentiment were they trying to convey? Much of what I saw looked like indifference, and a few dancers looked downright annoyed. Apart from the Prince wakening Aurora with a kiss, the second Act was a bit of a disconnect for me. Act III’s ‘The Wedding’ also could be abridged further. There are so many characters (each with their own internal bow) that it seems forever until Aurora and the Prince arrive for the grand pas de deux. Having said that, there were some noteworthy divertissements in the lot. The gold and silver fairies, Miranda Silveira and Kamryn Baldwin respectively, handled their variation with poise; Dores André’s flickering hands (as the diamond fairy) again conjured fluttering wings; and Thamires Chuvas’s White Cat and Alexander Reneff-Olson’s Puss in Boots injected some welcome whimsy. From the first duet through the solos and coda, Natasha Sheehan and Esteban Hernandez’s Bluebird pas de deux was filled with clean lines and specificity, Sheehan’s sense of balance pairing beautifully with Hernandez’s rebounding ballon. Next, Chung and Luiz returned to the stage for their final pas de deux, with its series of fantastic fish dives. Having the two duets right after each other creates a bit of tension. While we know that Aurora and the Prince both should and will close the Act, the Bluebird pas de deux really feels like a finale.